You will earn 2,712 Reward Points. Earn 1 reward point for every 1 dollar spent. Gas restaurant series range with large capacity (standard) oven. 35 7/16" (900mm) wide, 27" (686mm) deep work top surfaces. Total flame failure protection for all burners. Stainless steel front, sides and 5" wide front rail. 6" (152mm) legs with adjustable feet. Six Starfire-Pro 2 piece, 26,000 Btuh/ 7.61 kW (natural gas), cast open burners set in split cast iron ergonomic grates. 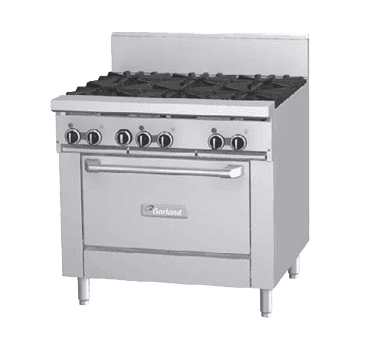 Griddle or optional hot-top with cast iron "H" style burners, 18,000 Btuh/5.27 kW (natural gas), in lieu of open burners. One piece oven with porcelain interior and heavy duty, "keep cool" door handle. Heavy cast iron "H" oven burner rated 38,000 Btuh/11.13 kW (natural gas) Oven controlled by even bake, fast recovery snap action modulating oven thermostat. Available with convection oven or as a modular top in lieu of standard oven. Convection ovens with 115V, 60 Hz, 1 phase, 3.5 amps motors are supplied with 6’ (1829mm) cord and plug (NEMA 5-15P); 240V 50/60 Hz. 1 phase, 1.8 amps are not supplied with cord and plug and must have a direct connect. GFE units without convection ovens –115V are 0.1 amps and 240V systems are 0.05 amps. Gas input ratings shown for installations up to 2000 ft.(610m) above sea level. Please specify altitudes over 2000 ft. NOTE: Ranges supplied with casters must be installed with an approved restraining device.